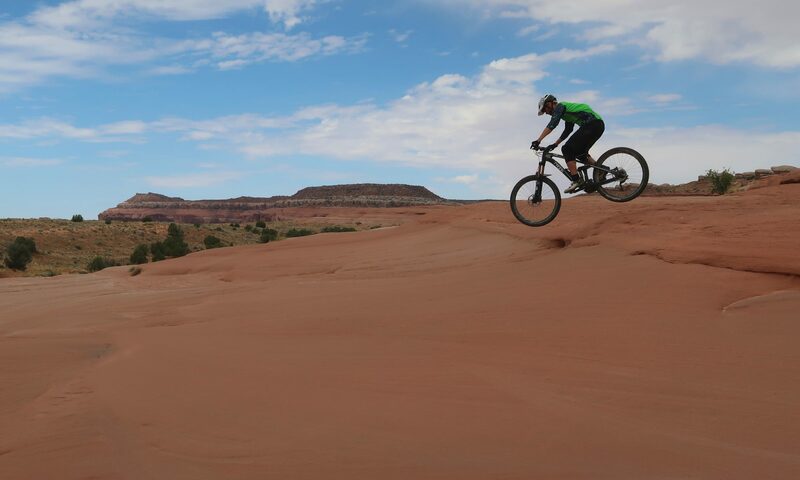 Whole Enchilada is the most raved about MTB-ride in and outside of Moab. And as the name suggests, it has it all: high-altitude alpine riding, smooth slalom berms, slickrock, views, technical challenges, etc. It can be ridden as an epic loop with a length of 61 miles/100 km and a total elevation gain of 8300 feet/2500 meters. For some reason we chose the shuttle ride option (like almost everybody else) that saved us almost about 1800 meters of climbing and costed only 25$. There is still a climbing part at the beginning up to Burro Pass that made us gasp and feel a bit dizzy due to the high altitude of 11.150 ft/3.400 m.
The trail from Burro Pass down is steep with some switchbacks and loose rocks, but all rideable. As the vegetation changes from alpine firs to birch trees the trail gets faster. In Hazzard County the trail is zippy and fun as it is winding through wide open plains. The Kokopelli Trail which is more a road than a trail leads to UPS and LPS, the upper and lower Porcupine Singletrack. This is the best section: the trail goes up and down slickrock with fast and flowy sections on packed sand surface. Views are stunning as the trail runs along the Porcupine Rim. At the intersection with the Sandflats Rd the Porcupine Rim Trail starts, a gnarly Jeep track that beats you up. Hard to enjoy. 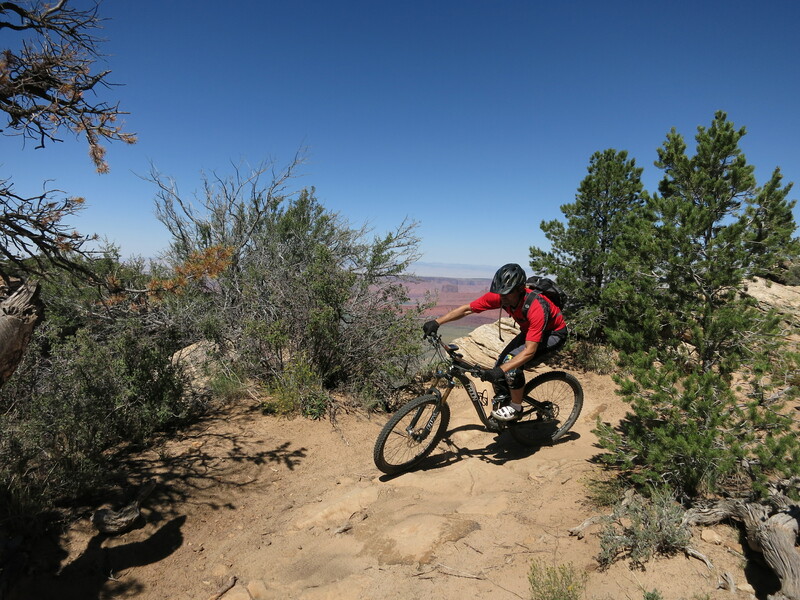 Eventually, when you are well shaken, the Porcupine Rim Trail becomes a singletrack again. This is where the fun comes back. The trail turns towards the Colorado River Gorge and comes up with some tricky technical challenges and spits you finally out at a parking lot at the river. The paved bike path along the Colorado River brings you back into town with sore wrists from the hundreds of drops that you did on this 35 mile/55 km ride and a big, big smile on your face.